Halibut is one of my favourite fishes. I love it's dense and firm texture. It shines with both bold flavours and in this case, delicate flavours. 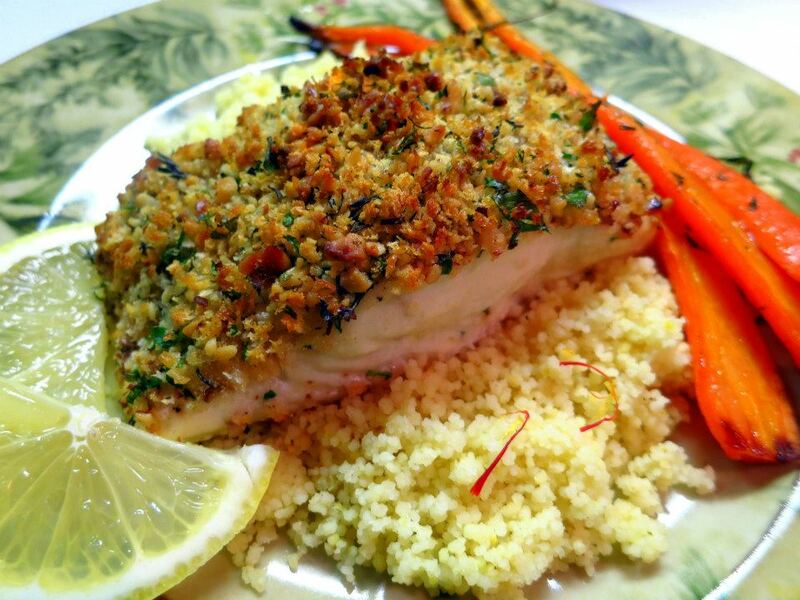 The combination of toasted walnuts & herbs compliments this fish perfectly. I served this dish with some Lemon & Saffron couscous and thyme roasted carrots. 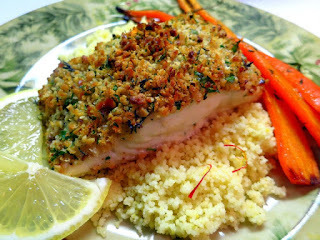 It's an elegant dish that will wow guests at any dinner party but it's quick enough to prepare for a weeknight dinner. Enjoy! 1. Preheat oven to 400°F. Spray a baking sheet with nonstick spray. 2. Mix walnuts, panko, and all herbs in small bowl with a pinch of salt and pepper. Sprinkle the halibut fillets with salt and pepper on both sides. Brush the top of each halibut fillet with some melted butter place the on the prepared baking sheet. 3. Sprinkle walnut mixture on top of each halibut fillet, dividing equally and pressing down to adhere. 3. Roast the halibut until just opaque in center, about 8-10 minutes (depends on your oven and thickness of your halibut fillets). If you want a crispier top, preheat broiler and broil halibut for about a minute, watching carefully to prevent burning. Serve immediately and garnish with lemon. YUM! Super healthy too. Looks great! That's a perfect way to prepare fish! I love the added crunch that this one has got to be the best part! Halibut is a definite favourite of mine as well Paula.